30 minute meal ideas to get dinner on the table, fast! Preparing healthy meals doesn’t have to mean hours in the kitchen. When your freezer, refrigerator and kitchen cupboards are well stocked, you can easily whip up a healthy meal in just 30 minutes. 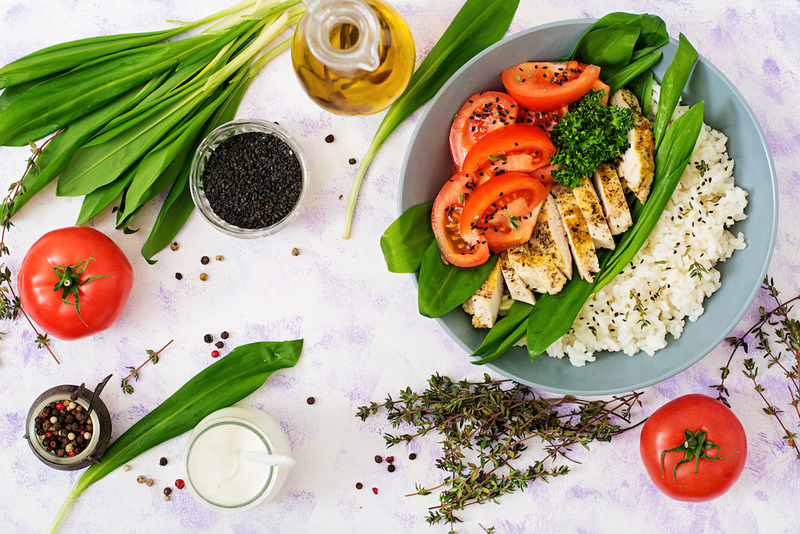 Setting aside time to prepare a healthy meal at home may sound like an impossible task – especially if you think it’s going to require hours of your time, and it can sometimes seem easier to eat out or order a takeaway. But doing this can make healthy eating a lot more difficult, so I’m going to show you how to make 9 healthy meals in 30 minutes or less. Not only will this save you money, but it also gives you complete control over ingredients, calories and portions, to help you reach your health and weight loss goals. Fish fillets: easy to use, since they don’t need to be thawed before cooking. Prawns: cooked or raw, and ideal for soups, salads, and stir-fries. Frozen vegetables: great for sprinkling into soups, pasta dishes or omelettes. My favourites are spinach, broccoli and peas. Frozen fruit: good for adding to smoothies, Formula 1 shakes or stirring into yoghurt. TOP TIP: Frozen banana can be blended up as a delicious healthy alternative to ice cream. - Milk (cow’s milk, soy milk or almond milk) for Formula 1 shakes or smoothies. - Eggs for omelettes or added to soups. - Greek-style yoghurt is a great alternative for sour cream, and is a delicious snack with some fruit. - Citrus fruits and apples are fairly long-lasting. Add fruits to salads for a nice flavour contrast, and use citrus fruits such as lemons and limes in cooking for extra flavour. - Peppers, celery and carrots usually last longer than leafy vegetables, and can be eaten with a meal or as a snack: raw, chopped and enjoyed with houmous. - Pre-washed salad greens such as spinach, kale or cabbage are convenient for putting together a side salad in minutes. - Chopped tomatoes make a great base for soups and homemade pasta sauces. - Tinned kidney beans, black beans and chickpeas are great for making soup, curry or houmous. - Quick-cooking whole grains such as brown rice, millet, quinoa, couscous, whole grain pasta make great high-fibre side dishes. - Tinned tuna adds extra protein to salads or pasta dishes, and can be used to make homemade fishcakes too. - Vinegars such as apple cider vinegar are great for adding flavour and provide many health benefits too. - Dried herbs and spices provide endless flavour variations. - Chicken and vegetable stock – great for adding flavour to pasta sauces and soups. - Extra virgin olive oil, coconut oil, sunflower oil etc. are all good for cooking everything from meat to stir-fried vegetables. - Onions and garlic – the flavour stapes that should be stored in a cool, dark place. TOP TIP: Make your own healthy salsa by frying diced onion and garlic, then mixing with a couple tablespoons chopped tomatoes, diced avocado and herbs. Once you’ve got all your basics, it’s time to let your imagination run wild. Since none of these recipes require extended cooking times, it shouldn’t take more than 30 minutes to prepare your healthy meal. Here are some of my favourite recipes for putting a delicious, healthy meal on the table quickly. Saute ½ diced onion, and one 1 diced courgette in olive oil until soft. Add two tomatoes, seeded and chopped and season with curry powder, ginger, garlic, cumin, cinnamon and cayenne. Add a can of chickpeas (drained), 125ml chicken or vegetable stock and a squeeze of fresh lemon. Add frozen spinach leaves, cover and cook until heated thoroughly. Adjust seasonings to taste, and serve on with quick-cook brown rice and a tbsp of Greek-style yogurt. Pasta with tomato sauce and prawns. Drain a large can of chopped tomatoes and sauté in a little olive oil over medium-high heat for 10-15 minutes until soft enough to mash with a fork. Season with salt, pepper, garlic and basil, then add frozen prawns and cook in the sauce until the prawns are cooked through. Serve on whole wheat pasta. This dish makes an easy, light dinner with a salad on the side. Coat a muffin tin with olive oil. In each muffin cup, add a few tablespoons of any chopped vegetables you like (e.g. frozen spinach or broccoli, with fresh onions and peppers). Beat one egg for each muffin cup you prepare, then pour the egg mixture over the vegetables and bake at 375 degrees (gas mark 5) for about 20 minutes until puffed and golden. Mix flaked tinned tuna with chopped vegetables, light sour cream (or Greek-style yoghurt), whole grain bread crumbs, Dijon mustard and lemon. Form into patties and cook in a little oil until brown on both sides. Saute ½ chopped onion in a little olive oil until soft. Add a can of black beans (drained), 500ml chicken broth and season with cumin, garlic, oregano and heat thoroughly. Mash some of the beans with a fork then add to the liquid to thicken the soup. Enjoy topped with some Greek-style yoghurt, diced avocado and a spoonful of salsa. Season small chicken fillets with salt and pepper. Heat a little olive oil in a large skillet and add the chicken in a single layer. Brown the chicken on one side, then turn the chicken over and add a few tablespoons of water, chicken/vegetable stock, balsamic vinegar or lemon juice. Cover, lower the heat and cook for 5 minutes until cooked through. Remove chicken pieces from skillet, turn heat back to high and cook juices until reduced to a glaze. Turn off heat, add chicken pieces back to pan and turn to coat. Serve with vegetables and a high-fibre grain such as quinoa. Rinse frozen fish fillets quickly to remove any ice. Pat dry, season with salt and pepper and sauté in a little oil until browned on one side. Turn, cover and cook until fish can be flaked easily with a fork. While fish is cooking, mix some pre-shredded cabbage with a little olive oil, lime juice, pinch of sugar, salt and pepper. Top corn tortillas with fish, cabbage mixture and salsa. Heat 1 litre vegetable or chicken stock with a dash of soy sauce, sprinkle of ginger, garlic powder, white pepper and a drizzle of sesame oil. Bring to the boil, then add 90g dry soba noodles and cook until noodles are almost done. Add diced tofu or frozen prawns, a handful of frozen peas and some frozen spinach and continue cooking until heated through. For extra protein, add a beaten egg at the last minute – it will cook quickly in the heated stock. Curried tuna and whole grain salad. A nice meal for a warm evening. Choose your favourite whole grain (couscous or quinoa are particularly good for this) and once cooked and cooled, mix with chopped vegetables (try spring onion, cucumber and carrots) and tinned tuna (drained). Add some diced fruit (apple, orange or mango) and dress with olive oil, rice vinegar, curry powder, salt and pepper. Written by Samantha Clayton. AFAA, ISSA Senior Director, Worldwide Fitness Education at Herbalife.